/ Best Burger Deal in Destin FL / Landshark’s Makes Destin Mondays Better with a $9.99 BURGER & BREW & Craft BEER TASTING@6PM! 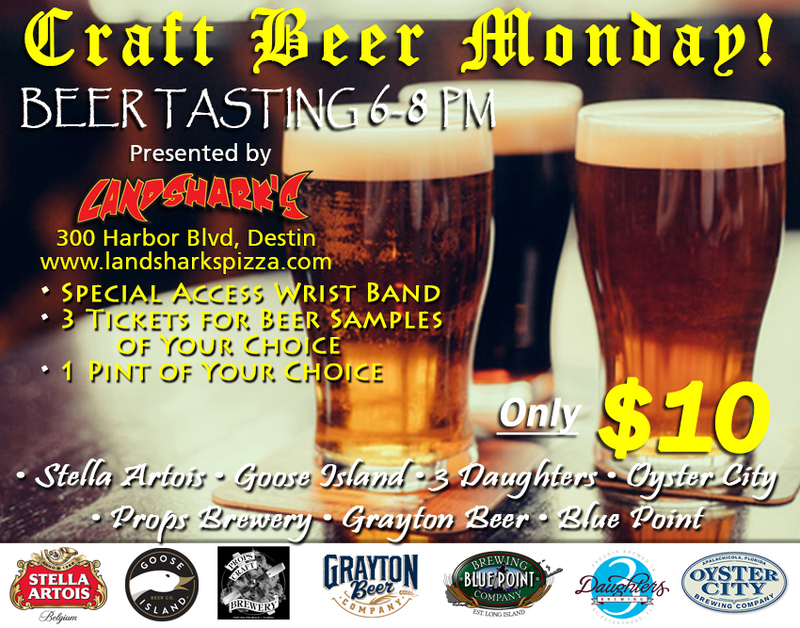 Landshark’s Makes Destin Mondays Better with a $9.99 BURGER & BREW & Craft BEER TASTING@6PM! It’s the first big eatin’ day of the week and we’ve got you covered with a sizzling hot slab of beef and and ice-cold beer to launch you into a great work week! Take advantage of a PREMIUM CRAFT BEER TASTING at 6PM – Join in for ONLY $10! Includes All-Access Wristband, 3 Tickets for sampling the Craft Beer Monday selections of your choice, 1 Full Pint of the Craft Beer of your choice! BUSY TRAFFIC GOT YOU DOWN IN THE DUMPS – FEELING TOO IRRITATED TO SLAVE OVER A HOT STOVE? NO PROBLEM! CALL FOR DELIVERY – The Delivery Guy sympathizes with your downtrodden plight and wants to see you freed from traffic-based oppression – let him set you free! Call (850)424-6743 for Dinner-time Nom-Noms 5PM to 9PM! 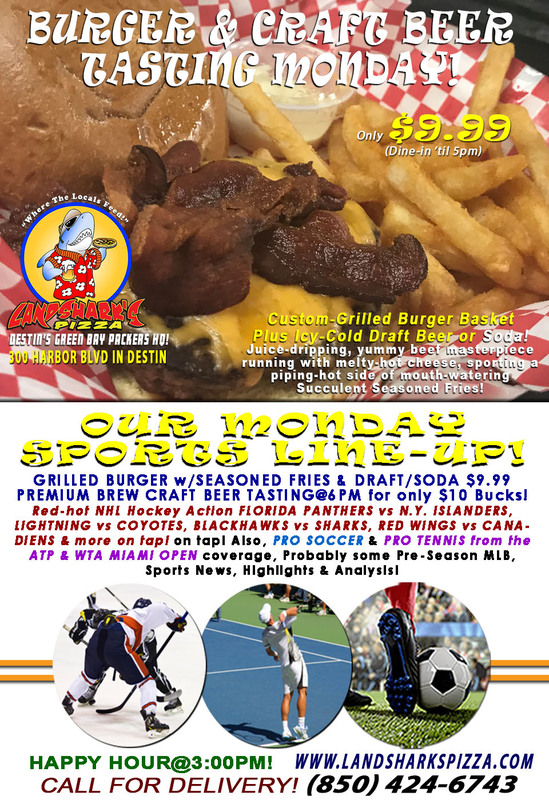 HOT SPORTS ON OUR ARMY OF BIG SCREENS – NHL Hockey Action FLORIDA PANTHERS vs N.Y. ISLANDERS, LIGHTNING vs COYOTES, BLACKHAWKS vs SHARKS, RED WINGS vs CANADIENS & more on tap! 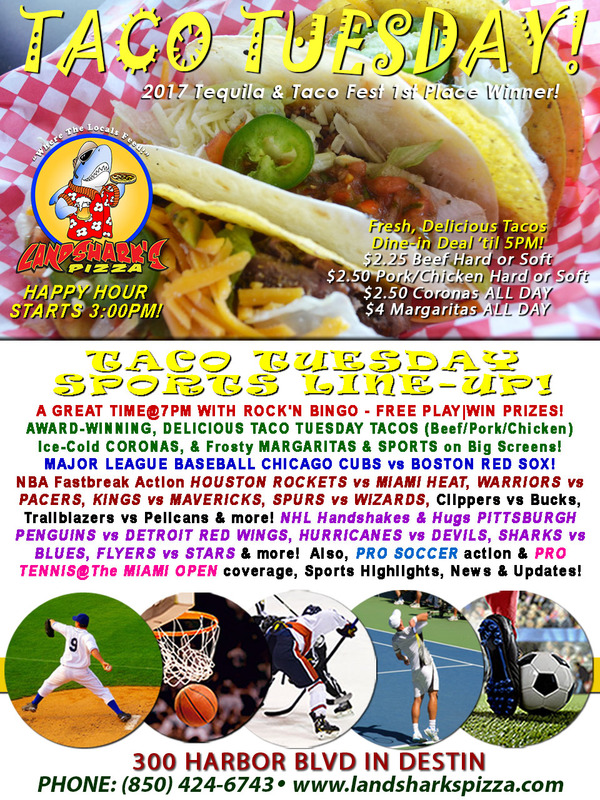 Also, PRO SOCCER & PRO TENNIS from the ATP & WTA MIAMI OPEN coverage, Sports News, Highlights & Analysis! 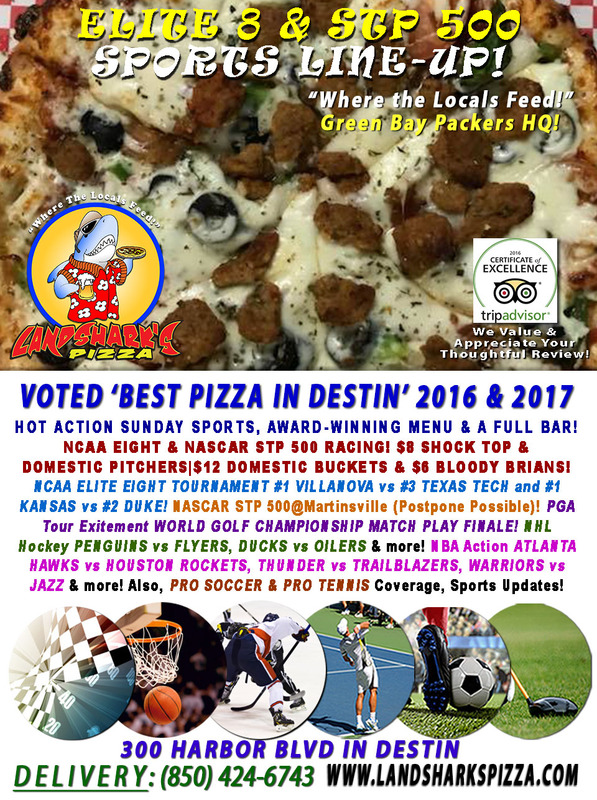 Previous Post: « Landshark’s in Destin NCAA ELITE EIGHT & NASCAR STP 500 & World Golf Championship $8 Pitchers|$12 Buckets!